Maybe "Fantastic Four" is a cursed property, or maybe just one that shouldn't be turned into a film? 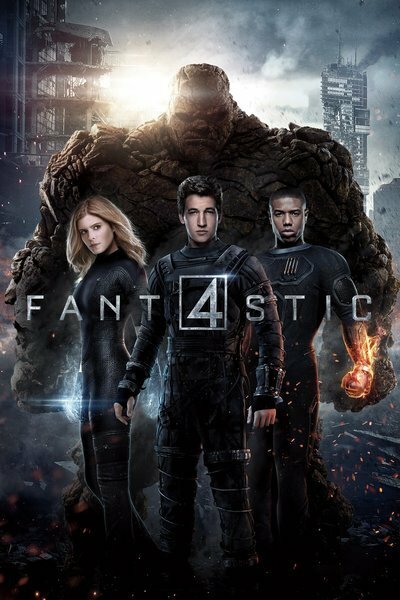 In any case, this new version, directed by Josh Trank, is the third major big screen attempt to tell the story of Reed Richards, Sue and Johnny Storm, Ben Grimm aka The Thing and Dr. Doom, the core characters in one of Marvel Comics' most durable properties. The good news is, it's short. The bad news is, it feels longer than an afternoon spent at the DMV—and at least at the DMV, you can pass the time by people-watching. There are no people to watch in "Fantastic Four," only collections of character traits and attitudes brought fitfully to life by actors who might've mistakenly thought they were hitching a ride on the superhero movie gravy train by signing up for this misfire. The movie starts off on an intriguing note, with 11-year old Reed Richards and his buddy Ben Grimm meeting for the first time when Reed sneaks into Grimm's family's junkyard to steal a transformer he needs to build a tiny teleportation device. Then the movie flashes forward to the present day, with Reed, now played by Miles Teller, and Ben, played by Jamie Bell, wreaking havoc with their invention at a science fair. Although the machine browns-out the power and creates an unnerving rumble and shatters a backboard in the gymnasium, it's an impressive enough display to cause Dr. Franklin Storm (Reg E. Cathey) to hire Teller to work at the Baxter Institute, which has been trying to solve the mystery of Planet Zero, the place where Reed's teleported objects always end up. The next hour of the film is another superhero origin story, introducing the doctor's two kids, the super-intelligent, science-minded Sue Storm (Kate Mara) and her juvenile delinquent brother Johnny (Michael B. Jordan, who's introduced in a street race that feels like an outtake from a "Fast and the Furious" movie). The comic's arch-villain Dr. Victor von Doom (what a name; wonder if he changed it from "Vahndüm"?) is also part of the team, and if you know even a little bit about the source material, you wait for the other iron boot to drop and turn him into an all-powerful megalomaniac. Doom used to be Sue's boyfriend and doesn't take kindly to the way she and Reed banter over keyboards and monitors. He's played by Toby Kebbell, who, to borrow a line from Andrew Sarris, looks like half the waiters on Melrose Avenue, but is quite good. His world-weariness and punk-Byronic glowering contrasts appealingly against the blandness of the other characters—even Jordan's Johnny, who's supposed to be a hot-rodding bad-boy a la Han Solo but reads, rather like Chris Evans in the last "Four" films, like a muscular male ingenue who occasionally quips and sneers. For a while, anyway, "The Fantastic Four" seems to be re-conceiving the superhero movie as a scientific mystery-adventure about how to solve the puzzle of the teleportation gate, send a manned mission to Planet Zero, and see what's there. This is only a partially effective approach, though, because the characters are so flat that not even this gifted cast can fill them with life, and because we're waiting for the characters to gain superpowers and figure out how to master them and then become a team. The latter is the whole point of an origin story, which has been rightly rapped as an overdone and mostly unimaginative movie template, but that still provides basic satisfaction when properly executed. You don't put the "getting powers" part an hour into a movie, as this one chose to, for some cockamamie reason, postponing the inevitable disastrous manned mission to Planet Zero, which is filled with body-warping cosmic radiation, until long past the point when anyone particularly cares about it. And after you've given your heroes and your bad guy their powers, you don't then suddenly veer off in another direction and make, essentially, "Fantastic Four, Part II," pitting the foursome (which now includes the orange, rock-skinned super-tough-guy Ben) against Doom in a series of battles that are packed into the space of about fifteen minutes, look and sound and feel unoriginal and cheap, and don't even explore the characters' abilities, and their emotional response to those abilities, in compelling ways. Ben in particular is ill-served. He doesn't have any of the personality demonstrated in the comics and even in previous film versions. He's just a quiet, nice guy, a stick figure, even when he's transformed. And once he is transformed, the film doesn't spend one minute asking what it's like to suddenly be a giant, rock-encrusted monster with stony Muppet lips. Ben just seems to be all right with it. I've heard of easygoing, but this is ridiculous. He acts like somebody gave him a haircut he didn't like. Oh, bummer, I wish this could grow out. Assigning blame for a disaster is always a tricky thing in reviews. Unless critics have intimate inside knowledge of everything that happened during a production, they end up citing other people's reported articles, which might or might not be accurate, depending on who's supplying them with facts, or "facts," and what their agendas are. We do know that Trank got fired off one of the "Star Wars" spin-off films, that he a producer on both that film and "Fantastic Four" don't like each other, that his enemies have painted him with the dreaded adjective "difficult", and that "Fantastic Four" underwent extensive re-shoots in the months leading up to release and Trank was not present for them. All of this complicates typical sentences in film reviews that treat the director as the captain of the cinematic ship (rightly or wrongly). That's why I've said "the film" does this or that rather than "Trank". I have no idea why this movie is so terrible, only that it is terrible, and there is no joy in noting the terribleness of a film. A lot of people spent a lot of time and energy on "The Fantastic Four" and the result just sort of lies there. The tone and structure of "Fantastic Four" should be studied in film schools as an example of what not to do. It's as if somebody took two pretty-decent feature length movies, broke them into pieces, and re-edited them into one film, but without any discernible plan beyond "get this down to 90 minutes." This is not a shortness issue, though. It's an everything issue. I'm not convinced that the movie's problems could have been solved with more scenes. Better scenes, definitely. And better characters. And better dialogue. Teller and Mara and Jordan and the rest are excellent actors; we know this from seeing them in other movies. If you encountered them here for the first time, you'd wonder what anyone saw in them. There is a whorishness to the big-budget superhero genre right now, a palpable sense of opportunism and greed that gives even the most earnest entries a faintly cynical veneer. Movies like this one, which show no outward evidence of having been created for any reason except to make money, do nothing to dispel that. The Marvel factory is indeed a factory, stamping out pre-sold intellectual property widgets with movie stars and the best visual effects that money can buy, but even their least ambitious products work. This one doesn't. It's defective, a discard, a huge ball of metal and plastic and spandex, all fused together. It's impossible to tell what it was supposed to be.